Good Morning Authentique Fans!! 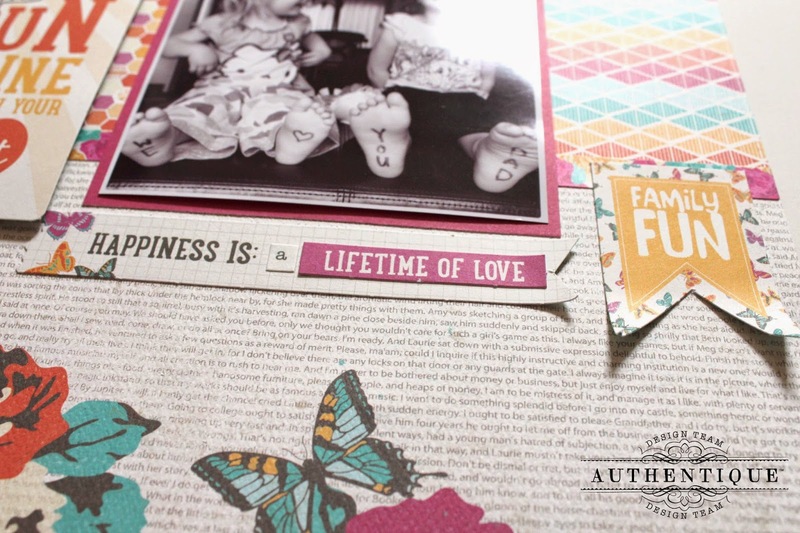 Heather here with a fun way to use up your Authentic Life Cards in a layout. I really love the Radiant Collection, and when I snapped this fun black and white photo of my girls, I knew that it would shine against the bright colors. I wanted the sentiments to shine amongst the patterns of this layout, so took a few of my favorite Radiant Collection Authentic Life Cards, and placed them on the top 2/3's of my piece of Whimsical. When I had figured out my exact placement of everything (in accordance to my photo as well), I adhered those to the sheet of Whimsical. Once that was complete, I took part of a sheet of the Foundation One to back my photo. Then I had fun adding bits and pieces from the rest of the collection to add more color and detail. I used a few of the pieces of the Components 6x12" sheet, the Petite Diction and the Petite Type from both Radiant and Harmony. I even sneaked a sticker or two from the Details sheet in there. I hope this gives you yet another way to use your Authentic Life Cards. 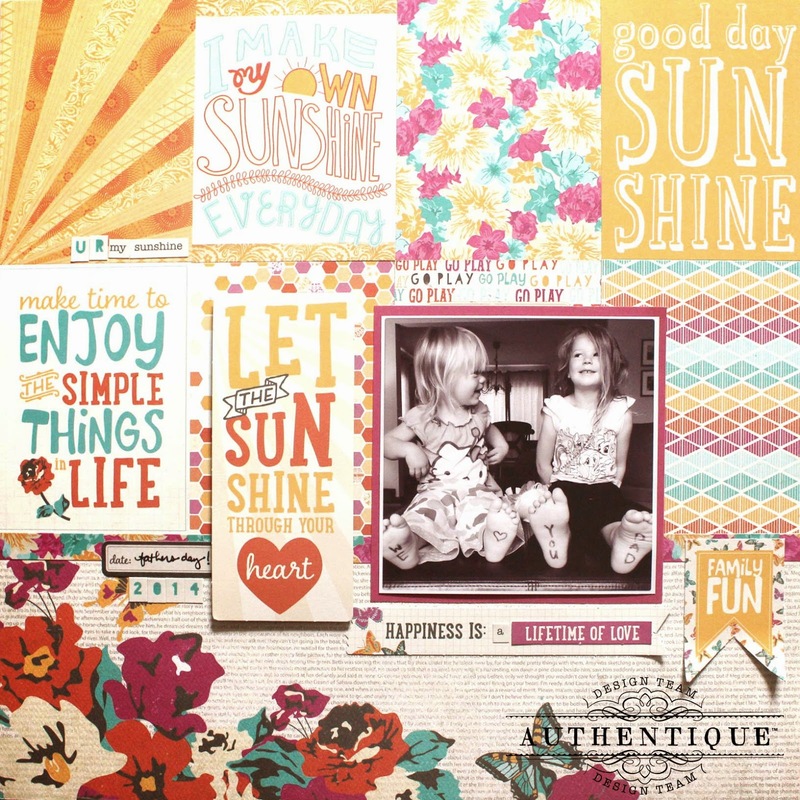 Remember to check out both sides of each card for the best sentiment, journal area, or pattern. I did quite a bit of switching around to find just the right pops of color for each section. Lovely layout! The pops of color look great with your black and white photo! 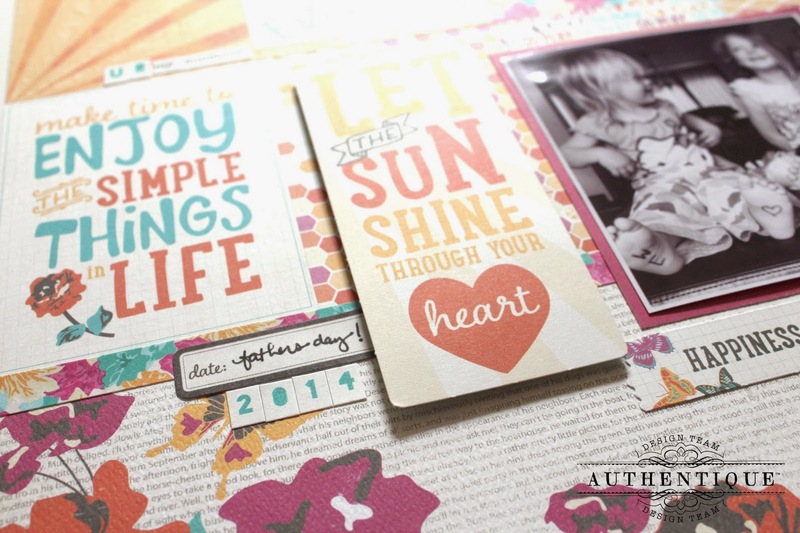 It is so fun to get creative with journal cards and I am so excited about the Authentic Life ones, they are gorgeous! Hadn't thought about using it for birthday cards, but what a great and quick idea. What a fun layout and I just love the colors! How clever to write a sentiment on the kiddos feet and photograph it! Beautiful designs! I'd use these for cards and layouts! Such a precious layout. I would use these lovely products for all my card making and Scrapbooking!!! Love the layout. These would look great on any sort of project. Such a bright and fun layout! I love how the Life Cards can be used for almost anything! Never used journal cards before so nice to see the different ways they can be used. Lovely project and the little girls are adorable. Love these cards! I'd definitely use them in my summer layouts! Very fun cards, would love to try on some layouts!!! They would make great sentiments on my greeting cards. What a unique layout and love how the life cards worked so well. Great idea, I'd probably use them on cards and in the kids pocket page albums. Makes it so much easier to keep up 4 albums during the summer and they work for all ages. Pretty cards! 3x4 is just my kind of size, perfect for 6x8 mini albums. Since I am primarily a card maker, I would use them to make some fun summer cards for my friends. Such a Lovely LO! Awesome job! I would use them to make cards. Beautiful layout! I would make layouts and cards. I like to make mini books and the cards would be great to add to the pages of the book as well as using them as pages in a book. What a fun layout! I would use these cards as a focal point for my canvas art! They would be awesome to use for a self esteem session! Then I would let the children use them in a project like a hanging plaque. I made 45 last month for VBS! Awe! Such sweet pics! I would probably use them to add interactive elements to my layouts If I were lucky enough to win. 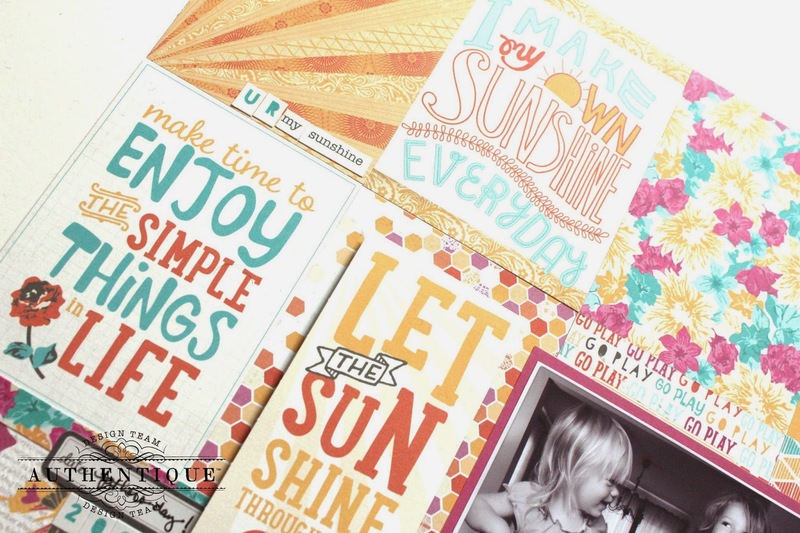 The sayings in the Radiant collection of cards would be fun to use with my cardmaking supplies!! Very cheery layout. These would be great on greeting cards too. 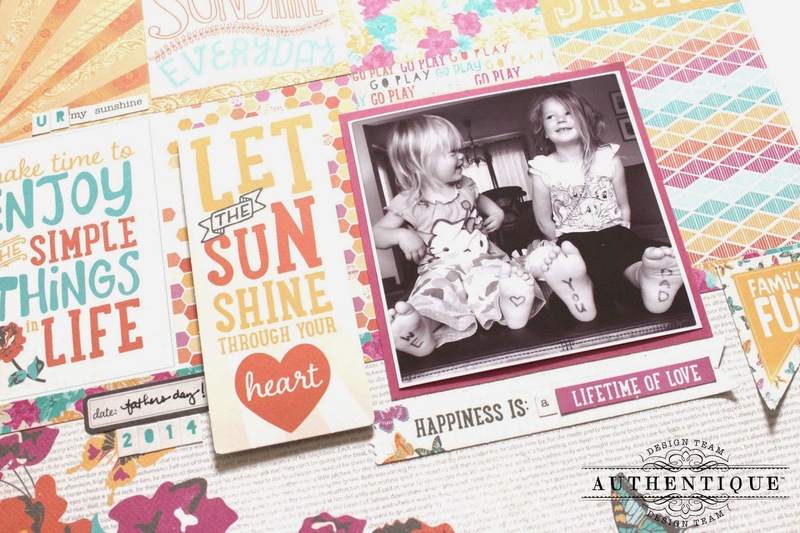 This is such an adorable layout with your two cute little girls! 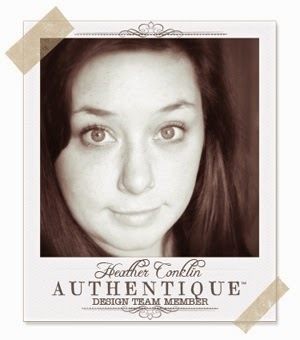 Just shows again how versatile Authentic's Life Cards truly are! Those cards look great and could be used for so many different types of projects! I would use those on my scrapbook! First, cute photo is the girls. This layout Rocks! I love the bright colors and the super cute cards. Thanks for the chance to win! These cards compliment these layouts and pictures so well and would love to use these for the same reason!